Beautifully preserved mosaics unearthed in a fifth-century Israeli synagogue have intrigued religious scholars with their depictions of both Biblical and possibly non-Biblical figures. 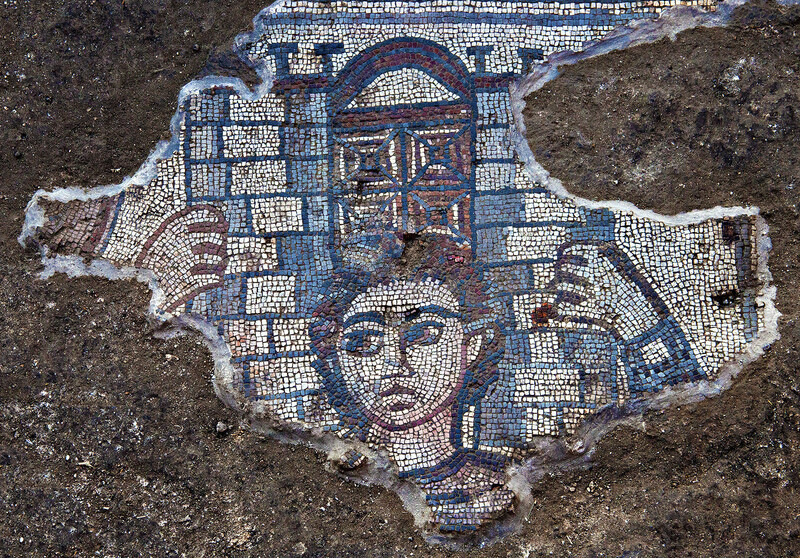 The stunning artwork was discovered as part of an ongoing excavation at a synagogue in Huqoq, an ancient Jewish village in Israel’s lower Galilee. A team has been working at the site since 2011, led in part by Jodi Magness, a distinguished professor of religious studies at the University of North Carolina at Chapel Hill. Magness told The Huffington Post she originally began the excavation in order to examine a specific type of late Roman architecture known as a Galilee-type synagogue. But in 2012, the researchers found their first mosaic: a somewhat fragmentary depiction of the Biblical hero Samson. As detailed in September/October issue of the Biblical Archeology Review, one of the team's more recent finds is a second Samson mosaic -- this one much better preserved. The discovery has led Magness to wonder if she might have stumbled upon Israel's first known Samson "cycle" (or grouping of several artworks featuring the same character) from around the fifth century. According to the Bible, Samson was a legendary warrior of great physical strength who defended the Israeli people against their enemies, the Philistines, Britannica notes. In perhaps his most famous story, Samson reveals to the seductress Delilah that his hair is the source of his strength, leading to his capture, blinding and enslavement. Something of a controversial figure in the fifth century, Samson was relatively unpopular with the rabbinical sages who disapproved of his consorting with non-Israelite women, according to Magness. However, the discovery of the Huqoq mosaics suggests that the warrior enjoyed popularity among lay people in the area, perhaps because of his reputation as a sort of "prototype" for the long-awaited Messiah, she told HuffPost. During the Late Roman period, both the Jewish and Christian populations in Galilee had strong expectations that either the Messiah (for Jews) or the second coming of Jesus Christ (for Christians) was imminent, Magness said. Samson's mythological associations with the Messiah may have therefore made him a favorite of these cultures, she explained. Another other mosaic unearthed by the archaeologists is also fascinating, albeit because of its dearth of Biblical context. With its colorful elephants and humans, the artwork appears to be apocryphal (or unrelated to the Bible) -- an extremely unusual find in a religious building. "It has absolutely no parallels in any other synagogue at all," Magness told HuffPost. "And there are no elephants in the Hebrew Bible." 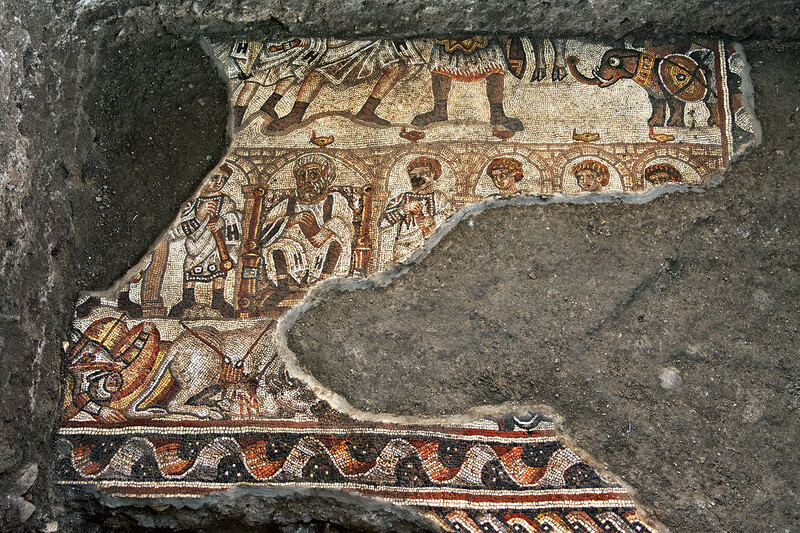 Some researchers have suggested that the mosaic is connected with the story of the Maccabees, a Jewish family that organized a successful rebellion in the second century B.C. "If [this theory is] correct, it would be the first time that a non-Biblical scene was depicted in an ancient synagogue," Magness said. "And that's really pretty amazing too." Magness said she and the rest of the team will continue to research the origins of their discoveries. They will return to the site next summer in the hopes of one day excavating the entire synagogue.